Wow I love all the colors here and how great you mixed them! Love this look on you! These shoes are gorg! Really cute colorblocking happening here. 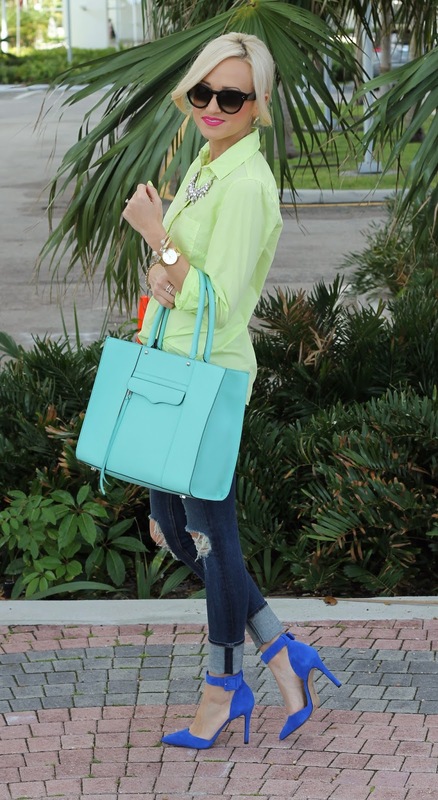 Love your mix of colors - those shoes are gorgeous! My favorite thing about your style is how you mix colors!! This outfit is adorable!! Love the combination of colors here...very reminiscent of the sea! Gorgeous pastel palette, and even more striking with those gorgeous pink lips! What lip color are you wearing? I'm glad I passed up the bag I was looking to buy yesterday, the Rebecca Minkoff is beautiful. Dear Jade: I just read the post about Diesel. I had a dog, Delila, who lived for 15 years, only to finally die from CHF. I thought I would die too, and never thought I would find another dog who even came close to her. But last year, a friend asked me to adopt a chihuahua named Elli, who had nowhere to go. So I did. I adore her. She is everything I could have hoped for, after Delila. I hope that God or fate, or whatever, brings you something or someone that you can also love as much as Diesel. It can happen!!! Love the mint, lime-green and cobalt blue paired together! Looks stunning and so well put together! This bag is incredible! And the colours of this outfit are great! Love the necklace with the shirt...gorgeous! Great outfit Jade, this outfit screams spring!